U.S. crude oil supplies increased 3 million barrels (0.76%) for the week ending May 24, according to an Energy Information Administration report (link opens a PDF) released today. After dropping 300,000 barrels the previous week, weaker refinery input (down 220,000 barrels per day) and a decline in imports (down 313,000 barrels per day) pushed oil supplies up to a new all-time high of 397.6 million barrels. 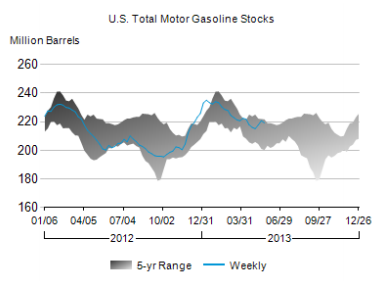 While oil inventories headed higher, gasoline supplies fell 1.5 million barrels and remain "in the upper half of the average range," according to the EIA. Demand remains weak, down a seasonally adjusted 2.4% over the past four weeks. Weaker demand helped push pump prices down to a national average of $3.645 per gallon for May 27. That's $0.028 per gallon less than the previous week and $0.025 less than May 27, 2012. 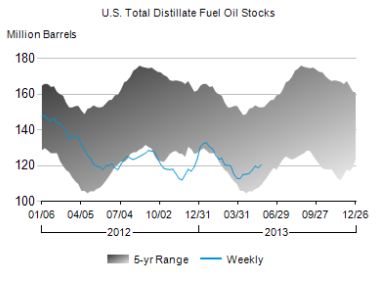 After falling 1.1 million barrels the prior week, distillates inventories bumped up 1.9 million barrels. Supplies remain "in the lower half of the average range for this time of year," and demand is a seasonally adjusted 1.4% in the last month. 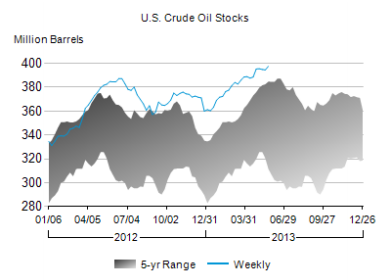 The article Crude Oil Inventories Hit Record Highs originally appeared on Fool.com. You can follow Justin Loiseau on Twitter, @TMFJLo, and on Motley Fool CAPS, @TMFJLo.Try any of our Foolish newsletter services free for 30 days. We Fools don't all hold the same opinions, but we all believe that considering a diverse range of insights makes us better investors. The Motley Fool has a disclosure policy.